Home » What is sleep paralysis? Is sleep paralysis common? What can be done about it? Ever had a feeling of either drifting off to sleep or awakening feeling completely paralysed and unable to move? Did you have hallucinations at the same time or a sense of vulnerability? This is sleep paralysis, a phenomenon where either on falling asleep or awakening you can temporarily experience muscle paralysis, only being able to move your eyeballs and breathe using your diaphragm muscles. 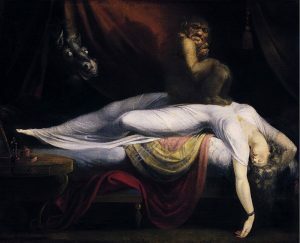 Episodes of sleep paralysis are often associated with dream imagery such as hallucinations which, for those who experience it regularly, can be terrifying. Throughout the ages, sleep paralysis has been described in a number of ways but has generally been associated with visits from spirits or religions visions. Many cultures describe variants of sleep paralysis. In Catholicism, the incubus and succubus are manifestations of sleep paralysis, where suffers experienced waking at night with a demon sitting on their chest and a sense of heaviness. In Old English, the term for this was Mare, forming part of the word nightmare. In Charles Dickens’ A Christmas Carol, Ebenezer Scrooge describes a ghost that visits him during sleep to his diet, which was a popular thought underling sleep paralysis in 19th century Europe. In Puritanical times, and New England, the term Old Hag was used for a fantastical creature that was sensed to be present and immobilised the person experiencing sleep paralysis as if sitting on his or her chest. a sense of heaviness in the chest. inability to move the muscles and feeling paralysed for between 30 seconds and 2 minutes. These features are incorporated in Fuseli’s painting, The Nightmare from 1781 shown above. For many people experiencing sleep paralysis, it is very frightening. The sense of vulnerability and being unable to get away, yet at the same time seeing frightening imagery, can be terrifying. The extent to which sleep paralysis can be terrifying was covered in a recent documentary The Nightmare, released in 2015, which followed eight people who described their experiences with sleep paralysis. Fortunately, most people experience sleep paralysis only very infrequently. Most commonly during times where sleep is disrupted or disturbed or during periods of acute illness, but some people can just have episodes of sleep paralysis for no apparent reason. This is called isolated sleep paralysis. However, for people with medical conditions such as narcolepsy or some other sleep disorders, sleep paralysis can be very frequent. Sleep paralysis occurs when people awaken from rapid eye movement (REM) sleep. REM sleep is characterised by a loss of muscle tone as well as dreaming. When awakening from REM sleep, there can be desynchronisation of switching on of conscious awareness, activation of muscle tone and transitioning from dreaming to awareness of the sleeping environment (internal to external stimuli). This leads to a period of time when muscle tone is paralysed, as it is in REM sleep, but conscious awareness is switched on whilst dream imagery is not completely switched off. This is usually a transient state that corrects itself fairly quickly within 1-2 minutes. It can be normal to have transient periods of sleep paralysis, particularly when sleep is disturbed such as with jet lag or periods of illness. However, some sleep disorders can increase the frequency of sleep paralysis. Most-commonly, this occurs in narcolepsy where people can go directly into REM sleep from being awake as well as awaken readily from REM sleep. There are also medical conditions that can have disrupted sleep regulation, not dissimilar to narcolepsy, such as neurological conditions like Parkinson’s disease, some dementias, acute delirium, psychosis and sleep breathing disorders such as sleep apnoea. What can be done to manage sleep paralysis? The most-important factor to reduce the impact of sleep paralysis is helping people to understand what it is, and that it is only transient and they will pass through it, rather than something that they will be stuck in for long periods of time. Some people find once they understand sleep paralysis and have better awareness of it coming on, that wriggling their fingers and using meditation-focused relaxation techniques to get through the period of sleep paralysis can be helpful. There hasn’t been any research in to this, but it is something a number of people had told me they find helpful. As sleep paralysis occurs when awakening or going in to rapid eye movement (REM) sleep, medications that suppress REM sleep can be helpful in reducing the frequency and intensity of episodes of sleep paralysis. Most antidepressants are powerful REM-suppressing medications and historically, antidepressants such as tricyclic antidepressants or selective serotonin reuptake inhibitors (SSRI) have been used as treatments for sleep paralysis. The other group of medications that can help are sedative medications such as benzodiazepines or benzodiazepine-receptor agonists such as zolpidem. 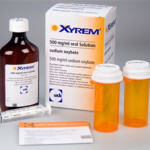 In people with narcolepsy, other sedative medications such as Xyrem (sodium oxybate) can also be used. Some of these medications are discussed in this post. I also find that for some people with narcolepsy, when symptoms of sleepiness are better managed during the day there are less frequent episodes of sleep paralysis. For more information on treating sleepiness in narcolepsy and use of Xyrem see this post. What should I do if I have sleep paralysis? Having occasional episodes of sleep paralysis is normal, particularly in the setting of disrupted sleep, either with shift work, sleep depravation or international travel across time zones. However, if you are having frequent episodes of sleep paralysis, particularly if you find them distressing, you should discuss your sleep paralysis with your doctor. They will review your overall condition and may refer you to a sleep specialist for further evaluation. Dreams: Do they have meaning? I used to experience sleep paralysis quit often several years ago. Was working night shift then and my sleeping time was around noon. Usually when it happens to me I hear a sinister laugh at the background. Terrifying at first but once I knew what it was, and that it’ll be over after a minute or so, I have learned to live with it.